Electric Corby attended the Low Carbon Vehicle (LCV2016)event organised by Cenex at Millbrook. 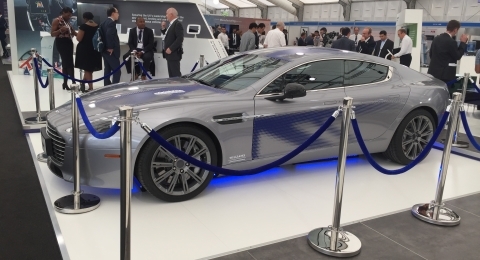 The exhibition presented a range of new technologies and ongoing projects (plus some amazing cars to admire).The highlight for myself was the host of professional seminars that offered a great insight into the area of Low Carbon Vehicles. A seminar session chaired by the CEO of Cenex, Robert Evans, addressed the implications of low carbon vehicles for energy supply and infrastructure. The seminar discussed two large-scale research projects; The Consumers, Vehicles and Energy Integration (CVEI) project and the Electric Nation project. THE CVEI project was investigating the impact that the integration of Low Carbon Vehicle technology would have on the UK energy system and the challenges that transitioning to a Low Carbon vehicle fleet present. This pioneering project could influence future policy and strategy within the Low Carbon Vehicles and energy sectors. Next up was the opening of Electric Nation, an innovative new project aiming to find a solution to issue of electric vehicle charging on the grid. As electric vehicle uptake increases, more are likely to be charged in clusters, and could cause strain on the grid. This is a project that Electric Corby is actively engaging with and supporting, as participants’ car charging at home will be monitored, with the findings helping network operators to manage the effect that electric vehicles will have on the grid. Participants will even get a free smart charger for their home (for more information on participating visit www.electricnation.org.uk). The Cenex’s LCV event goes from strength to strength with an obvious increase in support and attendance from the industry. For us it was informative and engaging with great speakers and an excellent exhibition, and will continue to be an event that Electric Corby attends to discover (and drive) the latest in Low Carbon Vehicle innovation.